If you read yesterday’s post on Inherited Stash, you’ll see that I promised a way of using up those odd bits of yarn we all have lying around. And if you’ve been following me for a while you’ll also know that I love sending my niece (aged 5) craft projects to do (I’m sending her these pompom makers and yarn from her Great-great Aunt). So this project ticked a lot of boxes for me, as well as being seasonal and letting out my inner child, because who doesn’t love pompoms? When I was younger I remember it taking ages to make pompoms because of constantly passing a ball of yarn through the middle of two cardboard circles. Well this method makes it a lot faster! Plus it is easier for children, because you can tie the pompoms before cutting the yarn. It does make a slightly flatter pompom than the traditional circle method, but I actually think that works well for this project. Scroll down for the printable pdf of this project! Pompom makers – so easy! You will also need to make a template for the ears. 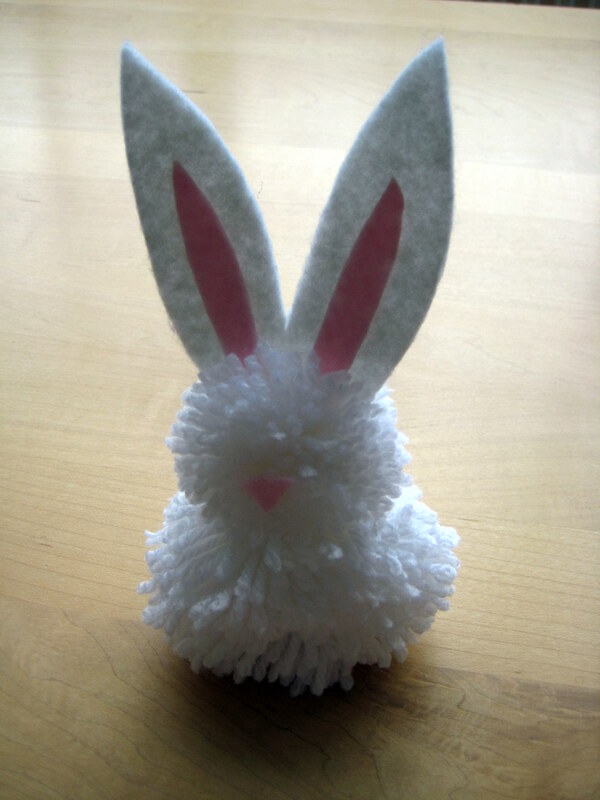 It is handy to make the ears before you make the pompoms. 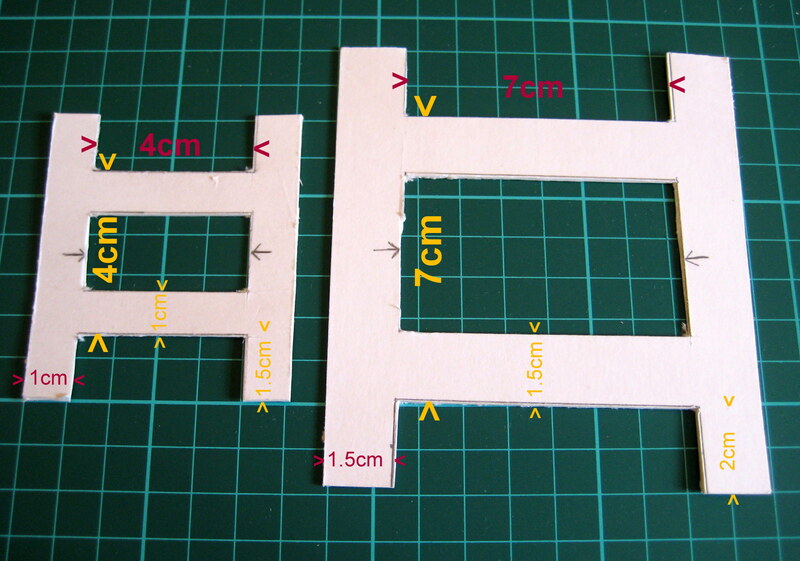 Draw out the shape below on some paper to make a template. 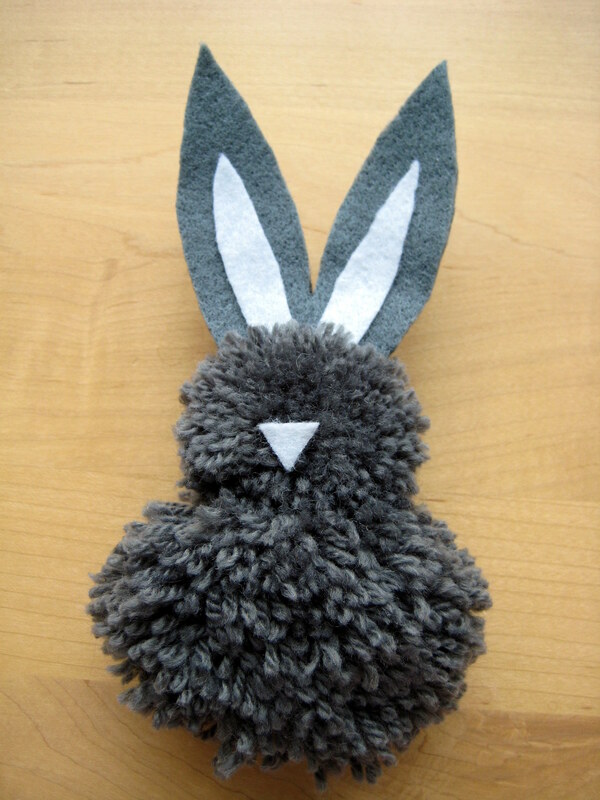 Large ears make for a cuter bunny, in my opinion, and my ears were 9cm tall and 7cm wide. 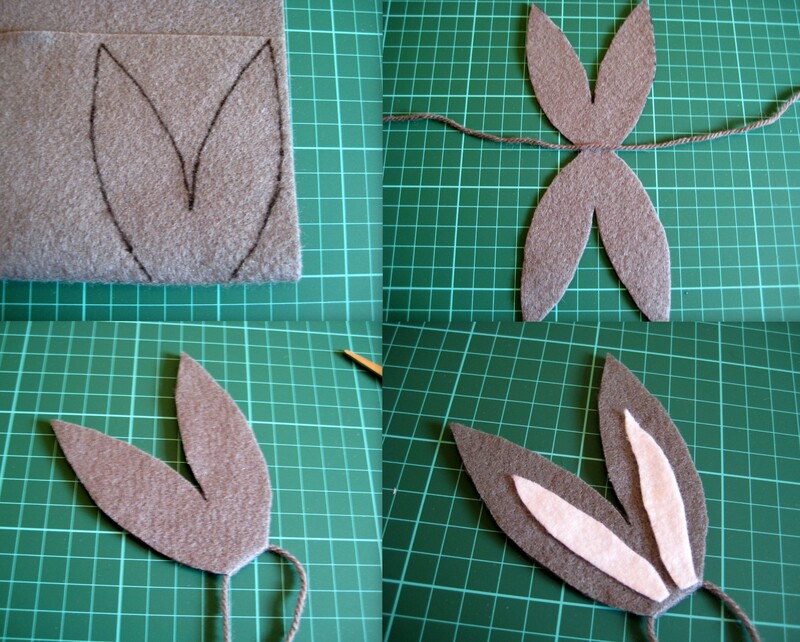 Once you have drawn your paper template, cut it out and place it on a folded piece of felt. Put the base of the ears at the fold line, so that when you cut it out you have a double layer which is joined at the base. Draw around and cut out the ears (but not along the fold). Lie a piece of yarn across the middle and fold and stick the ears together (I used a regular glue stick), so that the yarn is sandwiched between the layers. Trim the edges if needed. Now you can cut and stick on an inner ear colour if you like, using a second colour of felt. Now make the pompoms! Start with the smaller pompom. Simply wrap the yarn around the pompom makers. Try to make even layers and keep wrapping until you have done around 4 layers (the more you do the puffier the pompom, but also the more irregular the strands will be in length. Pull the strands to one side and thread through a length of yarn around the middle of the pompom. Tie as tight as you can without deforming the pompom maker. Thread a second piece of yarn around but don’t tie it yet. Now the fun bit! Cut the yarn carefully at both ends. 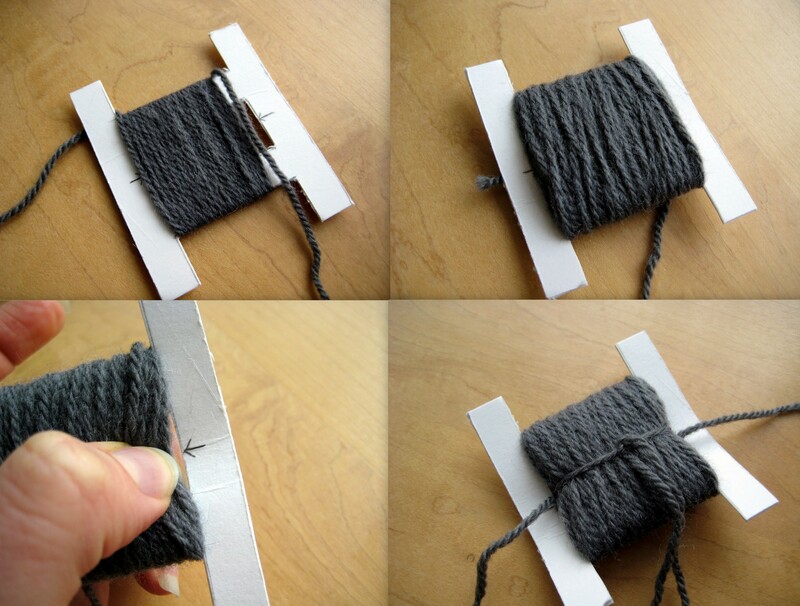 Once you have completed cutting, tie the second piece of yarn you put around the pompom, as tight as you possibly can. You may notice the original piece you tied around is very loose now; you can cut it away if you like. Push the pompom out of the maker. If you are just making plain pompoms, give it a shake to plump it out and trim any extra-long strands to make it even. 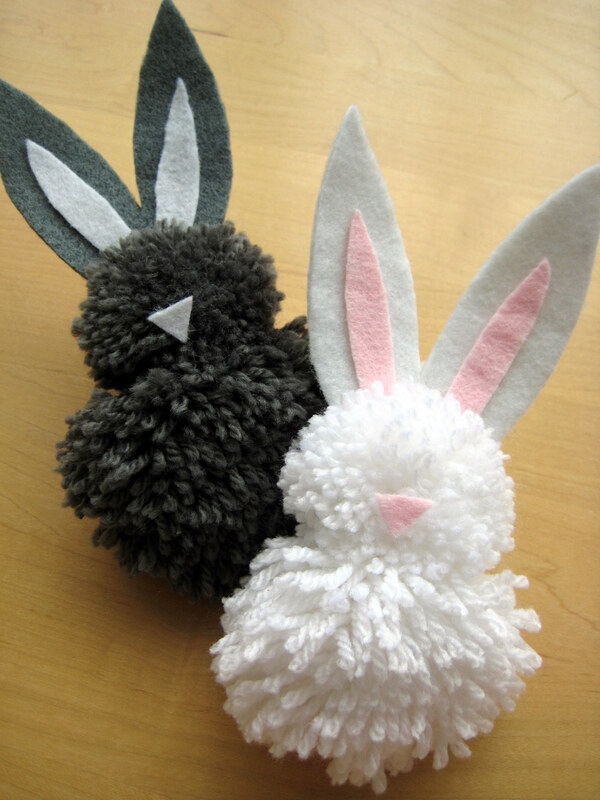 To continue with the rabbit, tie the ears on around the pompom using the sandwiched piece of yarn, around the existing tie, before you plump up the pompom. Don’t trim the tails of the yarn yet though! 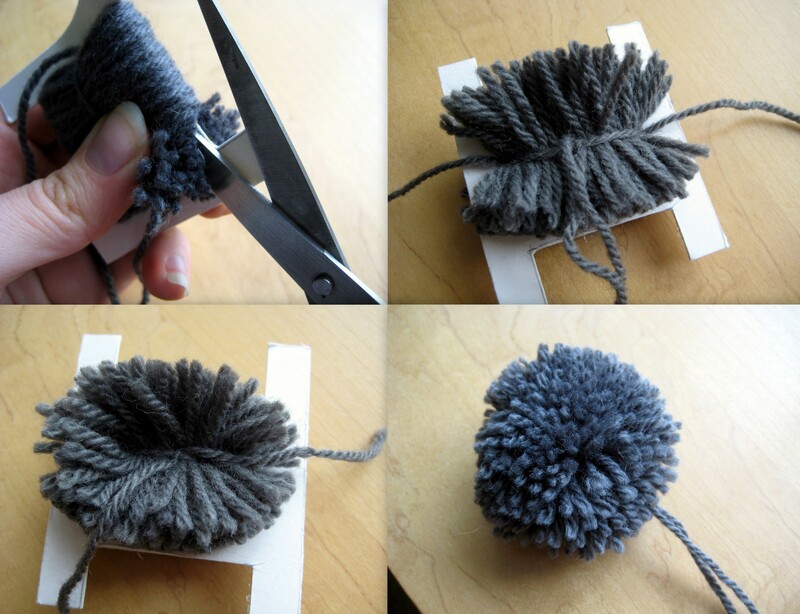 Make the large pompom in exactly the same way. Tie the head pompom to the body pompom using the tails of yarn from the head. Plump up the pompoms and trim any excess yarn. Cut a small piece of felt and glue on to make a nose, if you like. How about stringing a few together to make a garland? Or using as cat-toys? Thanks! Yes they are pretty quick to make and fun too. I was addicted as a child and made endless caterpillars by stringing them together.